Hunter Charf, Faith Kinney, Marissa Preister and Allyssa Burenheide. Pope John students recently participated in the 31st American Mathematics Competitions 8. 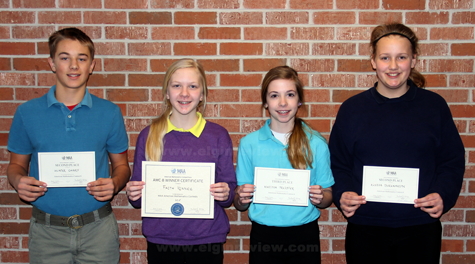 Ten 7th and 8th graders competed for local and national student and school awards. The contest, which covers middle school mathematics, is given at participating schools. Its purpose is to spur interest in mathematics and develop talent through the excitement of friendly competition at problem solving in a timed format. Certificates were awarded to the school’s winners: Faith Kinney (first place), Allyssa Burenheide and Hunter Charf (tied for second), and Marissa Preister (third place). Photo and information submitted.